What happened to the links that included the IMG tags? (i.e. [IMG]http://i.imugr.com/EXAMPLE[/IMG]) Was there any reason for removing that from the list of links provided for viewing the image? I can always add it myself, but it's more convenient to have the whole thing already there so I can just quickly copy-paste the pictures I need into the forum. And since I post images on a daily basis, that will start to get annoying. Ok, I hear you guys. I've removed the URL part from the BBCode. I understand your pain. But the fact remains that the service does not recommend hotlinking images without linking back. 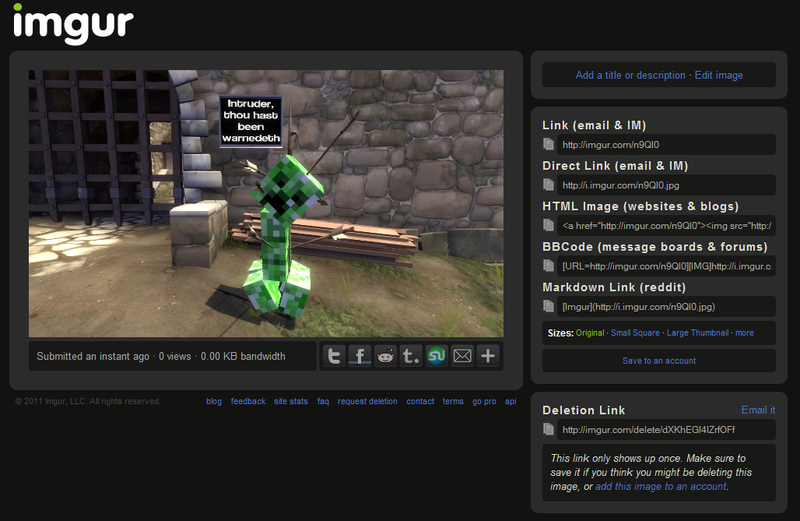 And the IMG code with URL code sort of work for you while linking back to IMGUR. You can remove the URL code manually but that sort of goes against the terms and conditions of the service. IMG with URL works fine as it still loads the same image that was being loaded earlier on. How is it hotlinking when they are our own images on a host site? I just tried a selective screencap (the long way since Hyperdesktop doesn't work now) and there's no IMG code for message boards. All image hosting sites give that. I meant some sites won't allow the url=http//imgur bit around the [IMG] code and will remove your pictures. You need to delete it so that it just begins [IMG] and ends [/IMG] as we had before. It is a pain though. That's what I'm getting at. The url= bit shouldn't be there in the first place. I do agree. Doubt any notice will be taken though. Like Hyperdesktop not working. Shame. imgur was great. Hyperdesktop is not made by Imgur and has no association with Imgur other than it being linked to in the Tools section. We can't control whether or not it works. Besides, I have it installed on several computers and have not had any trouble with it. Do you have the latest version? Notice the IMG code isn't listed there anymore. May I ask why? Actually it is there, [URL=http://imgur.com/GSHTr][IMG]http://i.imgur.com/IMAGE.png[/IMG][/URL] but it links back to imgur. Some sites will not allow that e.g. ebay. Well that's kinda annoying. I understand where they're coming from, but that's always aggravated me.